As renters struggle to find affordable place to live in Canada’s most expensive rental market, some are forced to think outside the box - or in this case sleep in one. 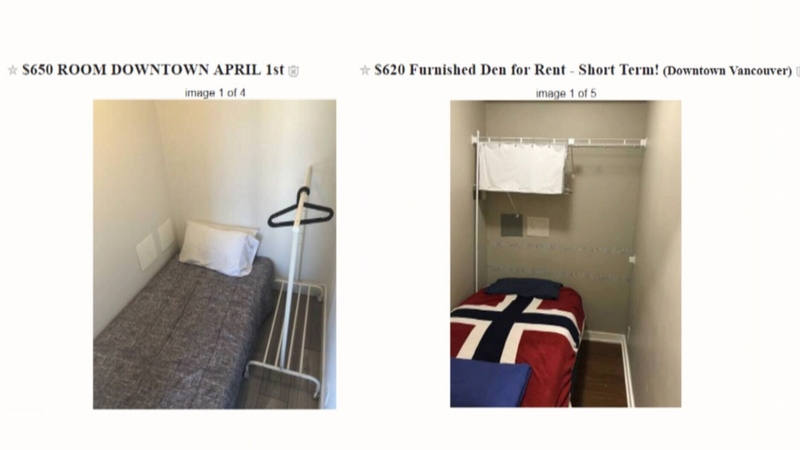 "Someone is renting out their closet,” said renter Jonathan Hamm as we showed him five separate ads on Craigslist offering dens converted into bedrooms. The ads ask for anywhere between $600 and $700 a month. Some target students, others ask for short-term international workers. Vancouver rental housing advocate Rohana Rezel calls these listings dangerous and inhumane. None of the listings appear to show whether these “dens” have a window, and some have hangers taking up lots of space. In other cases, electrical boxes are seen just inches away from the head of the bed. “These are not dens, they are closets” said City Coun. Melissa De Genova. She says the ads don’t appear to be legal but city staff is caught between a rock and hard place when it comes to enforcing rentals like this. “The last thing we want to do is see more people become homeless so it is definitely about finding a balance,” De Genova said. The city responded to a request through email and stated it, "will respond to complaints as received through 311 and VanConnect if tenants are concerned about the safety of their unit." Retired Simon Fraser University psychology professor Ehor Boyanowsky says if a person’s only option is to live in a space that small, it could have a negative effect on their mental well-being. “It reveals any cracks in your personality that may exist. Anything that is unusual about you starts to grow,” said Boyanowsky. He recommends you only approach a similar living situation voluntarily and spend as little time as possible inside when your living situation resembles the spaces seen in the Craigslist den ads. “If you have friends outside, you have a job outside, you love the outdoors, it’s like living in a very small tent,” Boyanowsky added. Converted dens listed as bedrooms for rent in downtown Vancouver are seen in these images from Craigslist.